Generally, neighbourhoods that are away from main roads offer some of the best terraces to sit down on and enjoy the balmy nights of Spring and Summer in Madrid. Plaza de Santa Ana is a great starting point for the evening in Madrid. A large square in the centre of the city that offers plenty of terraces and restaurants and cafés galore including a German bar that offers big cold glasses of German Wheat beer and a tapa to go with it. when hunger beckons then head to Mercado de San Miguel for a tapa in the coverted Station. 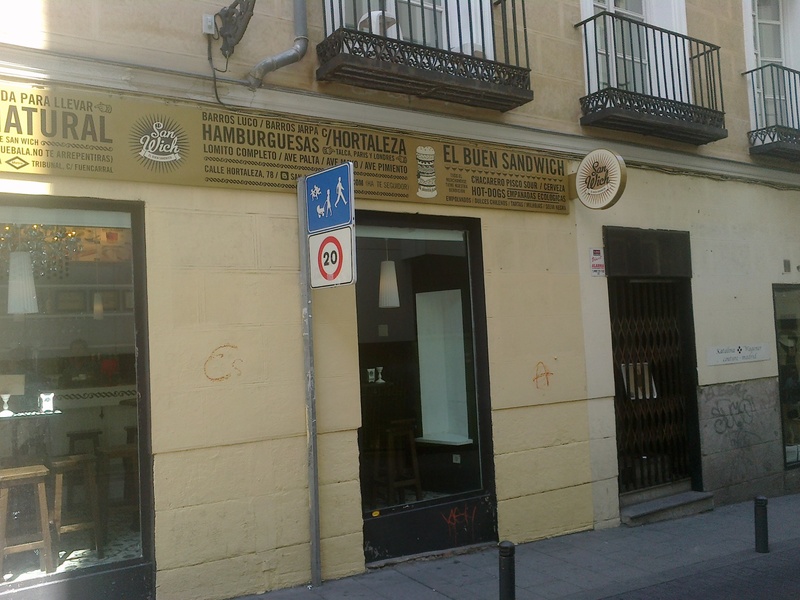 Its a stones throw from Plaza de Santa Ana. Another option for food is Casa Mingo which is famous for its Roast Chicken, Cider and Chorizos. In Winter there are plenty of terraces to find as these days bar owners have adopted outdoor heaters to attract more customers to their otherwise small establishment. There is something very comforting to sitting outside in Winter and being warm at the same time. Its become a bit of a tradition to go to La Latina on a Sunday at midday for beer and tapas. 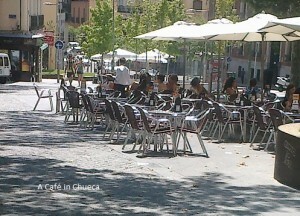 You might want to brave the crowds and try your luck at finding a table on one of the many terraces in calle Cava Baja and drink beer or wine and eat some of the great tapas and raciónes of the local cafés in this famous street. El Tigre is a totally recommended as a place to go and get a beer and plate full of whatever they offer you to eat only for the price of the beer which last time I looked was at 1,50 euros a small beer. Drink and eat for free. In Madrid its common to get a tapa with your drink. You really can go out and order beer all evening and eat very well for free. Some places seem to give you a better tapa each time you order a fresh beer. Great traditions! Plaza de Dos de Mayo in Malasaña offer an array of interesting bars and daytime shops of interest. Paseo de castellana is full of cool clubs and bars that are the in place to go to if you want to dance and have a bit bit more of an up-market atmosphere. There are businesses that offer trips and sporting activities that are well organised and cover most types of sports and adventure. Or, Go it alone and jump on a train (cercania) that will take you to Toledo or Segovia or San Lorenzo de Escorial for the day. These towns and villages make excellent day out excursions that offer long walks and plenty of fresh air. Culture in the city of Madrid is amazing. Musuems for every taste from Modern art to Classical art in the Prado Art Musuem to the Museo Thyssen Bornemisza that have a standing collection and a Special exhibition that changes every few months. Reina Sofia Art Museum offers standing exhibitions and a regular rotation of some of Europes and Spain finest Contemporary artists. Sorolla Museum has an exhibition of this famous Spanish artists work. His style is Realism and each work is enormous. Wonderful scenes of people enjoying life. If you are a student and have your card it can get you a discount in many museums around the city. Travelling around the city isnt as expensive as london or New York for example but make it cheaper still by getting a discount ticket. If you are under 21 you find a special pass for travel, depending on how long you are staying in Madrid. On Sunday Morning youcan visit El Rastro market and pick up a bargain Spanish style. The Market is considered one of the most crowded and biggest in Europe. Be careful of your wallet and purse, its an obvious workout for pickpockets. After the Market you can take a walk in El Buen Parque de Retiro which is a peaceful place to get over your hangover from the partying the night before. An absolute must tourist thing to do is go to Plaza de España and take your photo under the enormous statue of Don Quixote. Also, visit Puerta del Sol and get your photo on the plaque that marks the centre of the Peninsula Kilometro Zero as it is known. It can be located under the main balcony where the flags are flying over Sol. The Royal Palace is a wonder for the eyes in that both the building is tremendous and the surrounding gardens are well-kept and colourful feast for the eyes. Fuencarral Market is another choice for shopping for clothes and accessories. Avant Garde activities on offer are DJs, music and art exhibitions and Cinema projects.